I love Kitty and Kitty loves me. He comes when I call him . . . usually. We play fun games around this house, Like "Jump" and "Pounce" and "Catch the Mouse." Playing, chasing, scratching, purring. 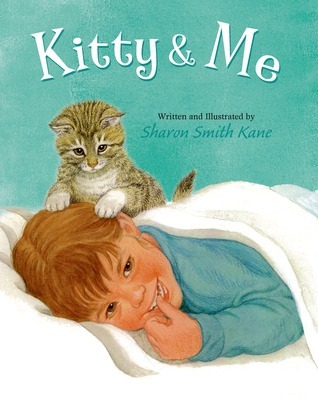 Kitty and Me is a charming rhyming story of best friendship between a girl and her growing kitten, by Sharon Kane, acclaimed author-illustrator of many beloved Little Golden Book Classics. This is a very old fashioned picture book, and I'm not sure how I feel about that. Author-illustrator Sharon Smith Kane is known for her Little Golden Books, so I guess it makes sense that this book follows that form. What I liked about Kitty and Me: It is written in a fun rhyme that kids will love to read, and about a topic that a lot of kids will enjoy. What I didn't like: I'm just not a big fan of the old-fashioned illustrations, like the ones often seen in Little Golden Books, even though I grew up with them. One of the things I love most about picture books these days is that they use a variety of art techniques that kids may not get to see in art elsewhere. This book just wasn't my cup of tea.